Any renovation takes creativity, patience and hard work. This is especially the case when it comes to older buildings as often there are more potential issues, risks and structural changes that require more effort and creativity. One can imagine that restoring a historic barn is no exception. This is not something that is beyond the scope of innovative architects in some places throughout the UK. A good example of this was an old barn situated in Suffolk that was converted into an amazing bed and breakfast. The barn itself underwent an extensive refurbishment. The outcome was that this barn that at one time was probably used to accommodate horses and other livestock was now able to accommodate the stay over of travellers and tourists. Using old barns such as this for this type of use makes a lot of sense. When you think about it the horses that were used in the old days needed a lot of room for their accommodations. They were big animals and needed stalls that were large enough to allow them to rest comfortably and move about in confined spaces. These are basically the same requirements that are placed on establishments that are providing overnight accommodations for people. In this barn restoration, the design was comprised of an open concept approach. It took on a communal type living space which works very well for a bed and breakfast establishment. The architects were able to take the space and convert it while using some of the existing materials during the restoration. 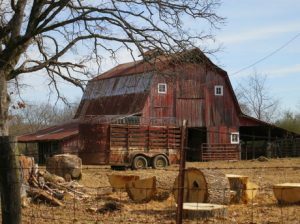 This allowed for the old ambience of the barn to be preserved which totally fits into the country style landscape. A barn restoration like this allows for the perfect getaway for those who love nature and history. Then for a little upscale excitement, guests can always check out the horse track in Suffolk to enjoy another venue of entertainment.